Here are the winners in alphabetical order: Ambrose Akinmusire, Kenny Barron, Brian Blade, Jane Ira Bloom, Regina Carter, Edmar Castaneda, Anat Cohen, Chick Corea, Dave Holland, Christian McBride, Pedrito Martinez, Jason Moran, Arturo O'Farrill, Nicole Mitchell, Gregory Porter, Chris Potter, Cecile McLorin Salvant, Maria Schneider, Wayne Shorter, Wadada Leo Smith, Gary Smulyan, Steve Turre, Warren Wolf, Miguel Zenon - plus record labels Columbia Legacy and Motema. 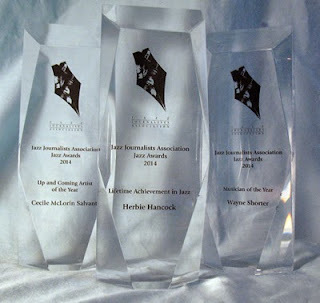 These awards will be distributed, and the journalism, communications and Jazz Heroes categories will be announced, on June 16th at the Blue Note in New York. The awards are the result of a two-stage ballot process among JJA journalists.